Last week marked the annual kick-off of Guru Guidance, the SMPS DC Chapter’s mentoring program. Now in its third year, the program pairs marketers at all experience levels, facilitating the exchange of ideas and experiences, as well as the sharing of industry tips and tricks. Gurus and their mentees meet monthly on an individual basis, and also come together periodically throughout the year to build relationships and learn as a group. 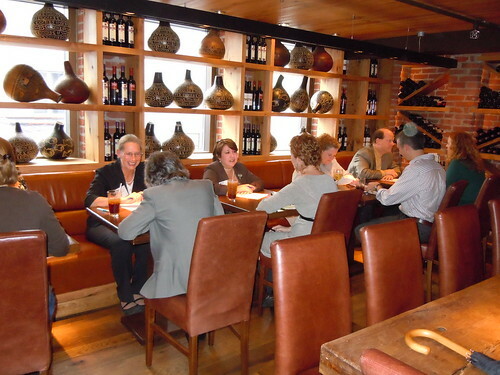 After attending an informational webinar in mid-October, participants gathered downtown in the cozy Wine Room at Nando’s Peri Peri last Wednesday. Mentees and gurus spent ten minutes with each pairing, getting to know each other and assessing who might make a good match based on several factors – career path, goals and aspirations, and location among them. At the end of the night, all participants ranked everyone with whom they had met according to preference. The Membership Committee compiled the results, and, fortunately, was able to link each attendee with one of his or her top three choices. This successful evening heralded the start of an exciting year for Guru Guidance! Feel free to contact program coordinator Candace Klepacz at candacek@theges.com with any questions.